If someone had said that to me 10 years ago I would probably have chuckled. 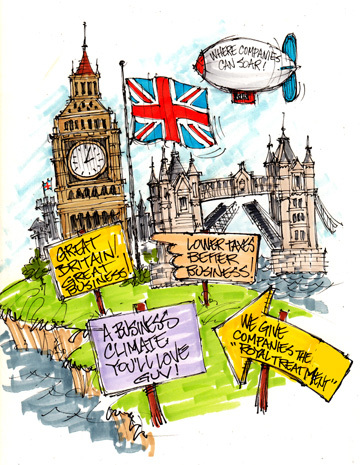 Recently though I attended a webinar put on by one of the Big 4 accounting firms about the UK as a business hub. It was a real eye-opener. The UK now has the most attractive tax regime of any G20 country. Here’s why! After years of losing business to many of their G20 brethren, UK authorities wised up and set a goal to become one of the most business appealing countries in Europe, if not the entire G20. A big part of that was to revamp their corporate tax regime. They needed to attract businesses to their shores to increase corporate tax revenues as well improve employment for their citizens. In the past ten years they’ve managed to reduce the corporate tax rate, change tax policy and create tax management tools around several major areas, making the UK an extremely attractive place to locate a business. For starters the UK corporate tax rate has been reduced to 21% and it is scheduled to drop to 20% next year. In 2003 the top corporate tax rate was 30%. Now a cut in the corporate tax rate by a third is no small matter and that factor alone makes the UK much more appealing, especially given that the top corporate federal tax rate in the US is now 35%. At 35% the US has the highest statutory rate of corporate income tax of any developed nation. IP has become a hot item in modern business and the ownership and right to generate income from it is a favorite item for scrutiny by tax authorities. In the past there was serious uncertainty about how IP was treated for tax purposes in the UK. Under new rules, the tax treatment and amortization of the IP acquired post 2002 has now been made clear as amortizable. A recent addition to the UK tax tools this year is that of the Patent Box. Starting in April 2013, the UK encourages companies to commercialize their patents and R&D in the country. Principals holding UK or EU patents in a Patent Box enjoy a special tax rate of 10% on income generated from the patent — be it sale of patented products, products produced by a patented process or patent licensing income. The Patent Box initiative is complementary to the R&D tax incentives which encourage companies to undertake their R&D in the UK. A 10% credit is available for qualifying UK sourced R&D activity expenditures. The credit is even available to companies with net operating losses. While the UK changes are appealing to business, the Wall Street Journal reported recently that the G20 countries have announced a 15 point plan to eliminate certain tax provisions that enable many multinational corporations to dramatically reduce their effective tax rate by isolating income in certain low tax jurisdictions. The UK, it appears, despite tax reforms the G20 may propose will likely continue to make an effort to remain as competitive as any G20 country. The tax rate alone will continue to make the UK attractive vis-à-vis other G20 countries. In addition to the changes described above, UK tax authorities are engaged with taxpayers in other ways to provide guidance on transfer pricing and other troublesome issues. These attributes taken together with a strong international business and research community, a mobile, diverse and skilled workforce plus an attractive location for senior executives and membership in the EU makes the UK an attractive hub for business. If your business is in the position to expand into Europe take a look at the UK and see if it makes sense as a gateway to the EU or as a regional headquarters.